Hi lovelies, I have a confession, I lost my mojo after having 2 months off and haven't been posting as much. 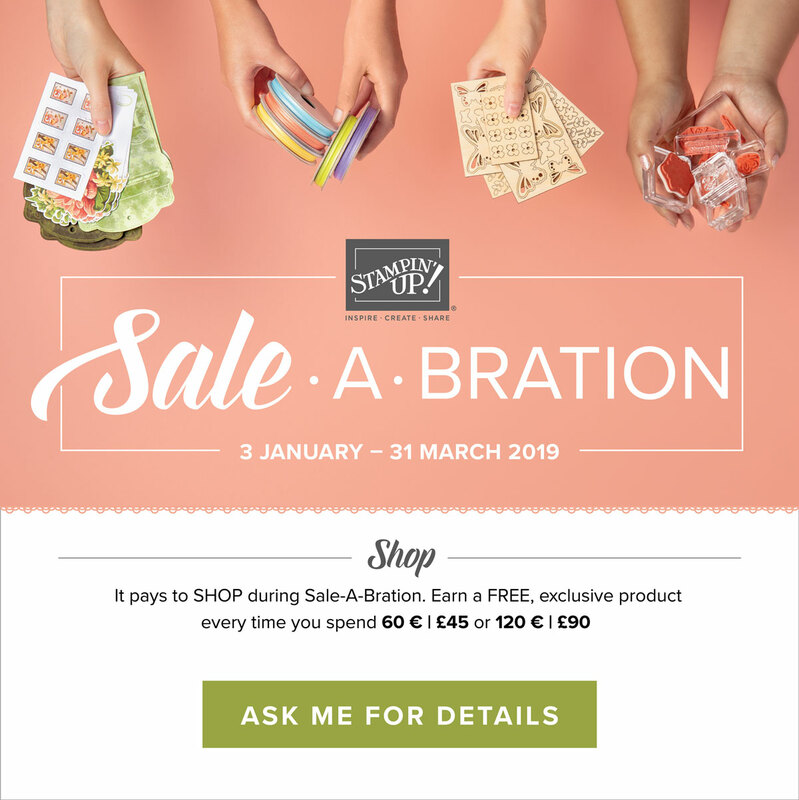 But I am back and sharing with you sale-a-bration. It has been running for one month and there is another two months before this wonderful promotion ends. Prices are the same as last year, for every £45 spent you can choose a level one product and for every £90 spent you can choose a level two product. You can purchase from the annual catalogue, sping/summer catalogue and the clearance rack. My online shop is open 24/7 and you can email me and I will respond asap during should you want to place an order via the phone or have any questions. This really is the greatest sale of the year and not only can you gain free products, Stampin' Up! have also release an even better starter kit offer! If you join my team and pay £99, you can get the standard kit which includes a free business kit and any products of your choice. However, the kit is worth £170 and usually it's worth 130 so thats an extra £40 of free product! You can join and spend £125, get the same kit listed above plus the brand new tote bag. I have one and it is amazing. Should you want a closer look I will happily post a video onto my youtube and social media. My team is growing slowly but surely and my extended team is massive so there is always a helping hand available from a variety of countries and timezones. You can also contact me and discuss hosting an event either online or in person and see what great rewards can be earnt during sale-a-bration. Let me know if you would like a free catalogue and I will also send you the PDF whilst you wait.